Beijing has said it would hit back against Washington’s escalating tariff measures, including through “qualitative measures,” a threat that US businesses in China fear could mean anything from stepped-up inspections to delays in investment approvals and even consumer boycotts. China could also limit visits to the United States by Chinese tourists, a business state media said is worth $115 billion, or shed some of its US Treasury holdings, Iris Pang, Greater China economist at ING in Hong Kong, wrote in a note. Investors fear an escalating Sino-US trade war could hit global growth and damage sentiment. On Wednesday, the MSCI’s broadest index of Asia-Pacific shares outside Japan was down about 1 percent, while the main indexes in Hong Kong and Shanghai recovered somewhat after falling more than 2 percent. 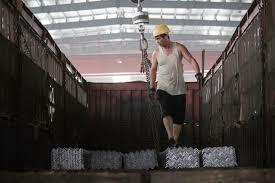 US President Donald Trump has said he may ultimately impose tariffs on more than $500 billion worth of Chinese goods – roughly the total amount of US imports from China last year. The US Chamber of Commerce has supported Trump’s domestic tax cuts and efforts to reduce regulation of businesses, but does not back Trump’s aggressive tariff policies. “In part because they have only limited ammunition and in part because it’s still early in the process on the US side,” Kuijs said.